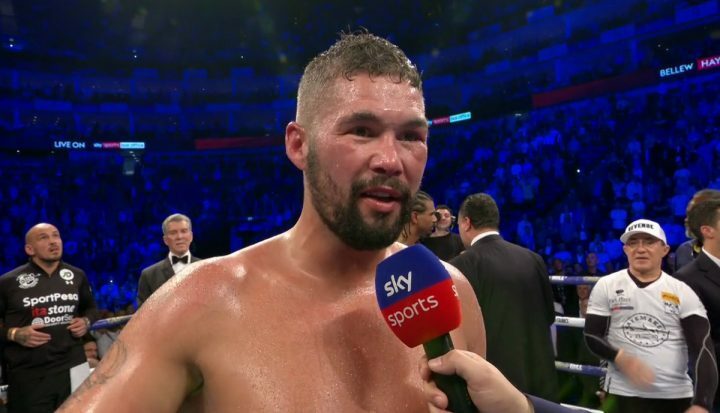 by Scott Gilfoid: Former cruiserweight champion Tony Bellew feels he’s a real threat to beating Tyson Fury (26-0, 19 KOs). Bellew’s two wins over David Haye has given him confidence that he can beat the 29-year-old Fury. Bellew knocked the over-the-hill Haye out in the 5th round on May 5th at the O2 Arena in London. Bellew, 34, is sounding very needy in wanting the Fury fight in the worst way. Bellew only wants big fights against stars or super talents like Murat Gassiev and Oleksandr Usyk. In other words, Bellew has become totally spoiled. That’s what happens to fighters after they get big paydays in consecutive fights against the likes of David Haye. Instead of staying active and proving themselves against the best fighters, they only want big payday fights. As such, they end up sitting on their backsides wasting time. Fury looked so bad in his recent comeback fight against Sefer Seferi that even a guy like Bellew could probably beat him, and he’s nowhere near the same class as the best cruiserweights Mairis Briedis, Oleksandr Usyk, Murat Gassiev and Yunier Dorticos. If Fury is going to fight a cruiserweight again, then he should at least fight the better ones in the division rather than wasting time on a dodger like Bellew. When Bellew held the World Boxing Council cruiserweight strap, he chose not to defend against Briedis. Instead of facing the Latvian talent, Bellew combed the bottom of the WBC’s rankings and picked out #14 BJ Flores for a nice safe title defense. After that, Bellew bailed from the cruiserweight division and moved up to heavyweight to face the injured David Haye. Bellew gives himself full credit for beating Haye, saying that he was still at his best. Unfortunately, that’s not the reality. Haye’s prime left him eight years ago after his wins over Audley Harrison and John Ruiz. Haye was never the same after losing to Wladimir Klitschko in 2011. Bellew is going to need to put on a lid on it while he waits for Fury to throw him a bone. The guy is still too fat and rusty to fight Bellew at this point. If Bellew is willing to sit and wait for a year, then he’ll probably get the fight, but it’s stupid for him to wait. Bellew is constantly banging on about how good he was back in the day when he was fighting at cruiserweight, but the fact of the matter is he never fought any of the good ones before leaving the division. Bellew needs to show some courage by calling out Dorticos or Briedis.